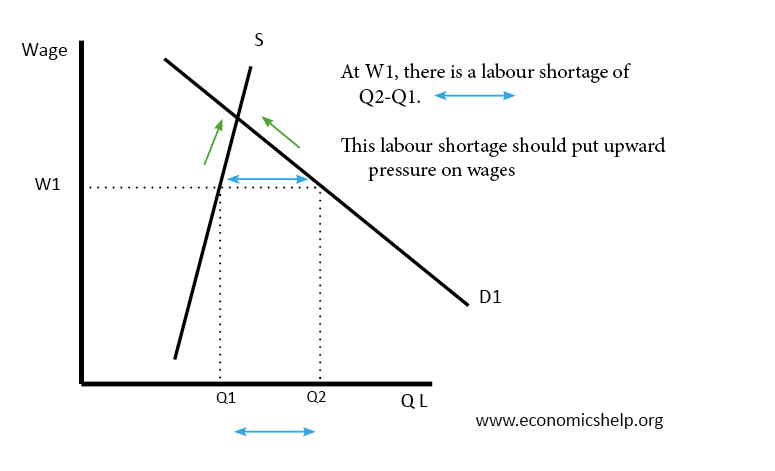 Labour shortages occur when employers struggle to fill labour vacancies because of insufficient labour applying for the jobs. Geographical shortages. An area with a booming economy, but poor housing can experience labour shortages quicker than the rest of the economy. In the UK, London has strong employment demand but suffers from high rent costs which make London relatively unattractive to workers, causing labour shortages. High skilled jobs. Occupations which require particular skills/qualifications have only a limited pool of workers who can apply. For example, an occupation like doctors/nursing requires a lengthy training period. If there is a shortage, there will be a considerable time lag in training new workers. Unattractive jobs. In the service sector or agriculture, there are some jobs which are hard to fill because of non-monetary costs and negative social perceptions about the job. For example, fruit picking – is long hours, repetitive work and exposed to the elements. In a developed economy with high expectations, farmers can struggle to fill these low-paid jobs, which are seen as undesirable. Social prestige. Job professions are not just about wages, but the prestige attached. In the UK, there has been a push to increase rates of students studying at university. For many schools and parents, vocational jobs, such as plumbing, electrician and technician are seen as relatively unattractive. The retail sector has a perception it is just a ‘temporary’ job and many want to avoid a career in this sector. Fixed pay. Public sector jobs have pay determined by the government and not market forces. For political reasons, the government may implement a prolonged pay freeze – even in public sector occupations where shortages are beginning to show. This is often a problem for an occupation like teaching, which is high-skilled but relatively low paid compared to private sector alternatives. Economy at full employment. Labour shortages will be more likely in vulnerable sectors when the macroeconomy is close to full employment. The basic economic response to a labour shortage is for firms to increase pay to attract more workers. If you ever wondered why it cost £60-£100 an hour to hire a plumber, it is partly due to the relative shortage of labour. In a free market, we will see higher wages in professions, such as lawyers, where there is a limited supply. Raising pay is only one possible response to labour shortages. It suggests ‘increasing pay to attract more UK-born nationals’ is quite low down on the list (7%) of possible responses. Farming – very tight margins, with monopsony buyers (Supermarkets putting pressure on farmers to keep prices low). Supermarkets also have the option of importing food if UK wages do rise. In the service sector, some jobs hard to replace with technology, e.g. hairdressing, baristas. Some jobs in manufacturing are easier to replace with increased automation. The difference between short-term and long-term. In the short-term, employers may leave positions unfilled, but in the long-term, this may be increasingly untenable. Labour shortages can increase the tendency for firms to look abroad for willing/skilled workers. If you have a shortage in nursing, it is very difficult to increase UK supply. Even higher wages would have little impact in the short-term. Encouraging migration from other countries is the easiest way to attract nurses to fill immediate shortages. Employers have often sought migrants for vacancies which are hard to fill – especially those with seasonal patterns. If fruit picking is six months, it can be hard to get a native UK resident to commit to a low-paid job for six months. However, it may suit a migrant from Eastern Europe, who can commit to working in the UK for relatively higher wages for six months and then returning. Some may argue that migration is a short-term fix to labour shortages. If migration is stopped, it will force an economy to deal with labour shortages by training relevant workers. However, limiting migration may not be enough. Lower levels of migrants don’t necessarily lead to increase in the number of trained nurses, builders and plumbers. There are also structural factors behind why people choose or don’t choose training qualifications. There could also be a period of shortages because it would take time for the labour market and educational institutions to respond to the labour shortages. The number of occupations affected by labour shortages and whether there is a knock on effect to other wages in the economy. Other inflationary pressures in the economy. At the start of 2017, a National Farmers Unions survey of labour providers, found by Aug and Sep 2016, 60% of farmers were unable to meet recruitment targets for workers. This is up from 0% at the start of 2016 and 13% in Q2 2016. The construction industry has also raised similar concerns. In London, over 50% of construction workers are migrants. Brexit could lead to labour shortages in this area of business. There has been no change in labour law, but the UK has changed perceptions as a place to work. The depreciation in the value of the Pound has also made the UK relatively less attractive to foreign workers. It is only one tentative survey, but traditional migration has helped UK labour market to be more flexible. If migrants were put off working in the UK through changing attitudes / legal limits, it could exacerbate labour shortages in certain occupations. There is no such thing as a labor shortage in the long run. If a sufficient number of workers cannot be found then the work, apparently, wasn’t worth doing. Importing workers should not be a resort, first or at all. If the position is not worth enough to justify higher wages it’s not worth doing. Labour shortage 🙁 no such thing…. We have to look at the reasons as to why no one wants to work, or do that particular job. Easy…benefits, when it’s far easier to get free money without doing anything. This is why companies look to immigrants, a lot use these jobs to earn big money, coming from third world country the wage is more than in their own country, and they use it to send money back home. Accepting lower standard of living (actually it maybe higher in comparison to where they come from: squat bedsit ) for shorter time means they can send more money back home. This money does not end up in our economy, so why encourage immigrants , and give them benefits? Best way to solve problem, only give min wage and benefits to British citizens. Also the farmers jobs used to be taken by students, well they get student grants now so no reason to work there. Benefits and immigrants have screwed the economy, anything that is unlimited is bad! Half the problem with countries like the UK, Australia, Canada & the US-always looks for the easy neo-liberal option;”Let’s poach other developing countries skilled workers!” a)saves on training costs b)keeps skilled worker’s wages down-this approach no longer works as Asian countries(eg-India & China) now also have emerging economies and will also be offering higher wages to retain their skilled workers home. Also, the UK was poaching skilled tradesmen from Poland in particular-esp-plumbers & electricians for London’s booming building industry. Also the US for years & years was poaching low-skilled Horticulture/Agriculture workers-primarily from Mexico that’s also coming to end now as well, as things in Mexico are getting better(after years of civil unrest) and wages are slowly rising,plus President Trumps new restrictions have seen these virtual “slave” jobs un-filled, unless the wages are put up, but don’t count on cheap Latinos to fill up these rubbish jobs anymore – It’s doubtful these people would ever return to the United States again! Also, the retiring Baby Boomers are leaving the workforce in droves-I don’t blame them! Unless real wages rise in the near future-the shortages of workers will only become worse!